If you have any questions or suggestions you are welcome to join our forum discussion about Combining Multiple EMAs with the RSI . 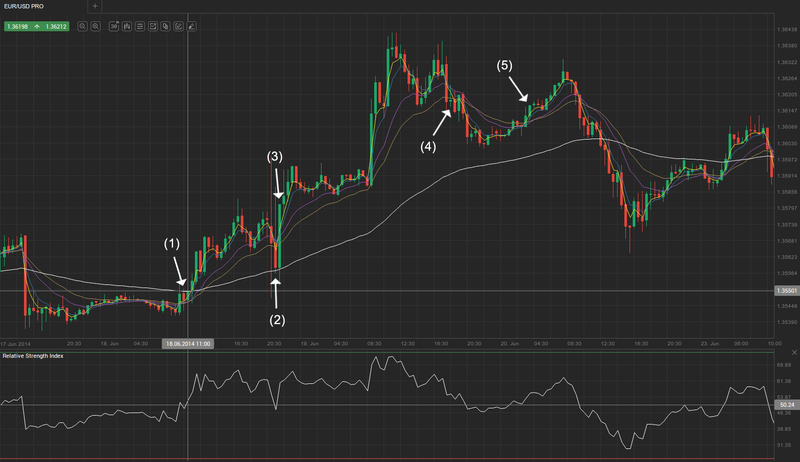 Previously in our trading strategies guide we explained a number of combinations between different indicators, but their number did not exceed two or three. In the current article we will present to you a trading system which is based on five different Exponential Moving Averages, combined with the Relative Strength Index. This trading strategy can be used with any currency pair and on almost any time frame, but a larger one is preferred – 30 minutes or higher. Although it will provide us with signals to enter counter-trend positions, for now we will abstain from commenting and visualizing them, because novice traders should not enter against the market at all. In case you are not a beginner, you will easily find out by yourself where to enter counter-trend. As we said, we will use five different Exponential Moving Averages. First, we need an 80-period EMA to show us the major trend’s direction – if the price is above the 80 EMA we have a bull trend and vice versa. Second, we will use a 21-period and a 13-period EMAs to point out the current trend’s direction (the current minor trend within the major trend). If the EMA with a shorter look-back period (in our case the 13 EMA) is above the one with a longer trackback period (in our case the 21 EMA), we have a bull minor trend, and vice versa. Third, we use two other EMAs with even shorter trackback periods in conjunction with the Relative Strength Index to generate entry signals. In particular, these are a 3-period EMA and a 5-period EMA, whose crossing, when supported by the appropriate RSI value, tells us whether to enter long or short. However, more conservative trading (which we advise novice traders to practice), calls for ignoring entry signals which are in the opposite direction of the 80-period EMA, thus the opposite direction of the major trend. Therefore, a long with-trend entry signal will be generated when the 3-period EMA crosses the 5-period EMA from below and edges higher, with both of them penetrating the channel of the 13-period EMA and the 21-period EMA. Moreover, the 80-period EMA must be below the price action (bull trend) and RSI must have a value exceeding 50. An entry must be executed after the signal bar closes beyond the 5-period EMA. Conversely, a short with-trend entry signal will be presented when the 3-period EMA penetrates the 5-period EMA from above and continues lower, with both of them crossing the channel made by the 13- and 21-period EMAs. This movement must also be coupled with RSI at level below 50 and the 80-period EMA must be above the price action. There are several exit strategy rules. You need to lock in gains, as soon as the 13 EMA and 21 EMA cross back and signal a reversal in the current trend, or if the 3 EMA and the 5 EMA cross back the channel, made by the 13 EMA and 21 EMA. Additionally, you need to exit, if the RSI crosses back the level of 50 or hits the overbought or oversold level (in our case we will use 75 and 25), which suggests the chance for an upcoming reversal has become much higher. Crosses of the 80-period EMA also mean an immediate exit. Check out the following example. The yellow line illustrates the 3-period EMA, while the 5 EMA is in blue. The 13 EMA and 21 EMA are in purple and brown respectively, while the 80-period EMA is colored white. As you can see, the market was in a trading range at the beginning of the chart, as evident by the flat 80 EMA. However, acceleration followed and the price and all the smaller EMAs crossed the 80 EMA from below at (1), generating a buy signal. At the entry bar the RSI was above the 50 level and both the 3 EMA and the 5 EMA had crossed the 13 – 21 EMA channel. The green line represents our entry level. At (2) the market performed a pullback and the 3-period EMA penetrated the channel, while the RSI fell below the level of 50, both signaling an exit of the position. However, because the bull trend continued and both the 3 EMA and the 5 EMA once again crossed above the channel, we again entered long above the close of bar (3). Seeing the following strong upward move, we could either scale out of our position and trail the stop behind the remaining portion or wait with the entire position for an exit signal. Such was generated at bar (4) when the small trackback EMAs crossed below the medium ones. There was only one other with-trend signal, which met the conditions of our strategy – at bar (5), which however was not followed by a strong enough move and resulted in a minor loss.